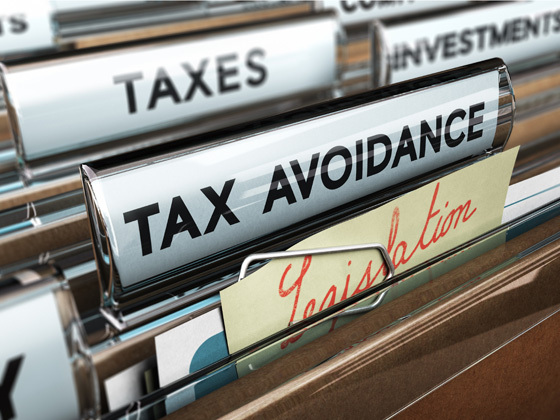 Who Loses from Corporate Tax Avoidance? Profitable corporations are subject to a 35 percent federal income tax rate on their U.S. profits. But many corporations pay far less, or nothing at all, because of the many tax loopholes and special breaks they enjoy. This report documents just how successful many Fortune 500 corporations have been at using loopholes and special breaks over the past eight years. As lawmakers look to reform the corporate tax code, this report shows that the focus of any overhaul should be on closing loopholes rather than on cutting tax rates. It’s important to note a key piece of this report’s methodology. The report only includes corporations that were consistently profitable over the eight-year period from 2008 to 2015. In other words, if a firm had a loss in even one year, it is excluded from this report. By leaving out corporations that had losses (which means they wouldn’t pay any tax), this report provides a straightforward picture of average effective tax rates paid by our nation’s biggest and consistently profitable companies. Two hundred and fifty-eight Fortune 500 companies were consistently profitable in each of the eight years between 2008 and 2015. Most of these companies were included in our February 2014 report, The Sorry State of Corporate Taxes, which looked at the years 2008 through 2012. There are new companies in the report, including Netflix, which entered the Fortune 500 after 2013. In addition, some companies were excluded from the study because they lost money in 2013, 2014 or 2015. As a group, the 258 corporations paid an effective federal income tax rate of 21.2 percent over the eight-year period, slightly over half the statutory 35 percent tax rate. Eighteen of the corporations, including General Electric, International Paper, Priceline.com and PG&E, paid no federal income tax at all over the eight-year period. 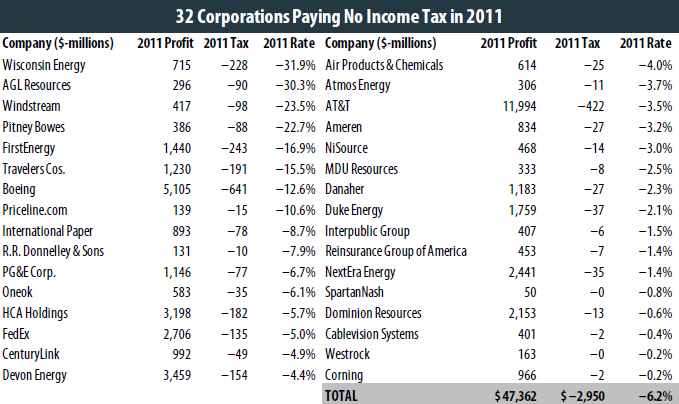 A fifth of the corporations (48) paid an effective tax rate of less than 10 percent over that period. Of those corporations in our sample with significant offshore profits, more than half paid higher corporate tax rates to foreign governments where they operate than they paid in the United States on their U.S. profits. One hundred of the 258 companies (39 percent of them) paid zero or less in federal income taxes in at least one year from 2008 to 2015. The sectors with the lowest effective corporate tax rates over the eight-year period were Utilities, Gas and Electric (3.1 percent), Industrial Machinery (11.4 percent), Telecommunications (11.5 percent), Oil, Gas, and Pipelines (11.6 percent), and Internet Services and Retailing (15.6 percent). Each of these industries paid, as a group, less than half the statutory 35 percent tax rate over this eight-year period. 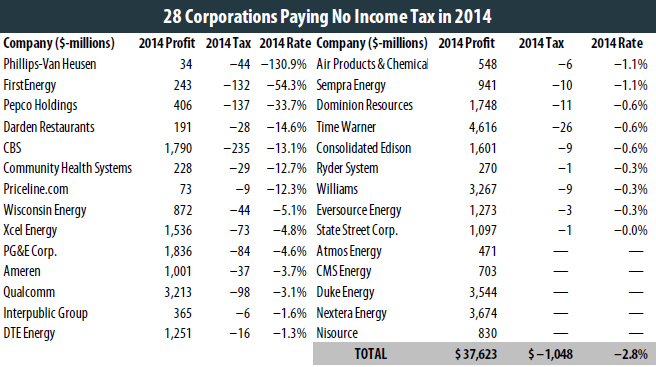 The tax breaks claimed by these companies are highly concentrated in the hands of a few very large corporations. Just 25 companies claimed $286 billion in tax breaks over the eight years between 2008 and 2015. 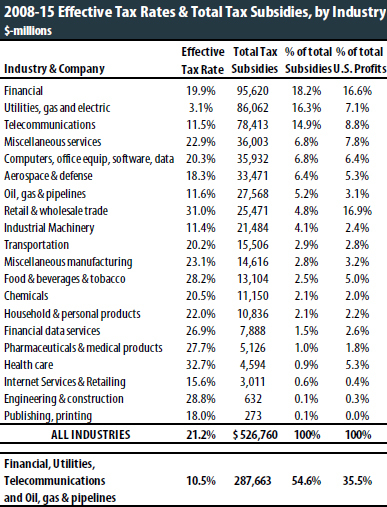 That’s more than half the $527 billion in tax subsidies claimed by all of the 258 companies in our sample. Five companies — AT&T, Wells Fargo, J.P. Morgan Chase, Verizon, and IBM — enjoyed more than $130 billion in tax breaks during the eight-year period. Congress should repeal the rule allowing American multinational corporations to indefinitely “defer” U.S. taxes on their offshore profits. This reform would effectively remove the tax incentive to shift profits and jobs overseas. Limit the ability of tech and other companies to use executive stock options to reduce their taxes by generating phantom “costs” these companies never incur. Having set “bonus depreciation” on a path toward expiration at the end of 2019, Congress should take the next step and repeal the rest of accelerated depreciation, too. At a minimum, lawmakers should resist calls to expand these tax breaks by allowing for the immediate expensing of capital investments. Reinstate a strong corporate Alternative Minimum Tax that does the job it was originally designed to do. Increase transparency by requiring country-by-country public disclosure of company financial information, including corporate income and tax payments, through filings to the Securities and Exchange Commission. For the first time in more than three decades, comprehensive corporate tax restructuring is a serious possibility in Washington. Republican leaders in Congress and President Donald Trump have each put forward corporate tax plans that would cut the corporate tax rate by as much as half. This misguided consensus is largely the result of a long-term aggressive push by corporate lobbyists on Capitol Hill to reduce the federal corporate income tax rate, based on the claim that our corporate tax is uncompetitive and high compared to other developed nations. This study takes a hard look at federal income taxes paid or not paid by 258 of America’s largest and most profitable corporations in the eight years between 2008 and 2015 — and compares those tax payments to the foreign taxes that a multinational subset of these same companies pay on their activities in the rest of the world. The companies in our report are all from Fortune’s annual list of America’s 500 largest corporations, and all of them were profitable in the United States in each of the eight years analyzed. Over eight years, the 258 companies in our survey reported total pretax U.S. profits of more than $3.8 trillion. While the federal corporate tax law ostensibly requires big corporations to pay a 35 percent corporate income tax rate, the 258 corporations in our study on average paid slightly more than half that amount: 21.2 percent over the 2008 to 2015 period. Many companies paid far less, including 18 that paid nothing at all over the entire eight-year period. We also find that for most of the multinationals in our survey — companies that engage in significant business both in the United States and abroad — the U.S. tax rates these companies paid are lower than the rates they faced abroad. More than half of the multinationals in our survey enjoyed lower U.S. tax rates on their U.S. profits than the foreign tax rates they paid on their foreign profits. There is wide variation in tax rates paid by the companies surveyed. A quarter of the companies in this study paid effective federal income tax rates on their U.S. profits close to the full 35 percent official corporate tax rate. But almost one-fifth paid less than 10 percent. One hundred of these profitable companies found ways to zero out every last dime of their federal income tax in at least one year during the eight-year period. There is plenty of blame to share for today’s sad situation. Corporate apologists will correctly point out that loopholes and tax breaks that allow corporations to minimize or eliminate their income taxes are generally legal, and stem from laws passed over the years by Congress and signed by various presidents. But that does not mean that low-tax corporations bear no responsibility. The tax laws were not enacted in a vacuum; they were adopted in response to relentless corporate lobbying, threats and campaign support. The good news is that the corporate income tax can be repaired. The parade of industry-specific and even company-specific tax breaks that weaken the corporate tax can — and should — be repealed. This includes tax giveaways as narrow as the NASCAR depreciation tax break and as broad as the manufacturing deduction. High-profile multinational corporations that have shifted hundreds of billions of their U.S. income into tax havens for tax purposes, without engaging in any meaningful activity in those tiny countries, will stop doing so if Congress acts to end indefinite deferral of U.S. taxes on their offshore profits. As Congress considers these steps, lawmakers and the Securities and Exchange Commission should act to ensure that they, and the public, have access to basic information about how much big companies are paying in taxes and which tax breaks they’re claiming. the end of the study explains in more detail how we chose the companies and calculated their effective tax rates. The notes on specific companies beginning on page 56 add more details. On paper at least, federal tax law requires corporations to pay 35 percent of their profits in federal income taxes. In fact, while some of the 258 corporations in this study did pay close to the 35 percent official tax rate, the vast majority paid considerably less. And some paid nothing at all. Over the eight years covered by this study, the average effective tax rate (that is, the percentage of U.S. pretax profits paid in federal corporate income taxes) for all 258 companies was only 21.2 percent. The table on this page summarizes what the 258 companies paid (or didn’t pay) in effective U.S. income tax rates on their pretax U.S. profits. • 30 companies paid effective eight-year tax rates between zero and 10 percent. Their average effective tax rate was 6.9 percent. • Even worse is that 18 companies paid less than 0 percent over the eight-year period. Their effective tax rate averaged -4 percent. • 66 companies (about a quarter of the companies in this report), paid effective eight-year tax rates of more than 30 percent. Their average effective tax rate was 33.6 percent. • 100 of the 258 companies paid zero or less in federal income taxes in at least one year from 2008 to 2015. 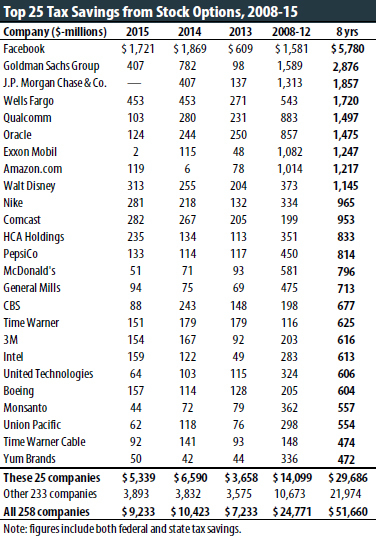 Fifty-eight of these companies enjoyed multiple no-tax years, bringing the total number of no-tax years to 246. 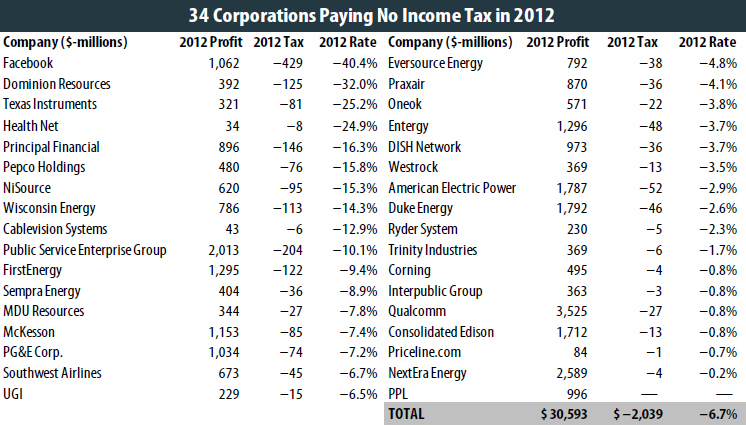 In the years they paid no income tax, these 100 companies earned $336 billion in pretax U.S. profits. But instead of paying $118 billion in federal income taxes, as the 35 percent corporate tax rate requires, these companies generated so many excess tax breaks that they reported negative taxes (often receiving tax rebate checks from the U.S. Treasury), totaling $32.1 billion. 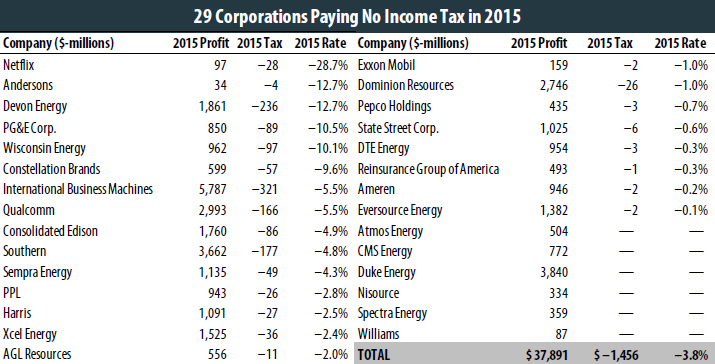 These companies’ “negative tax rates” mean that they made more after taxes than before taxes in those no-tax years. 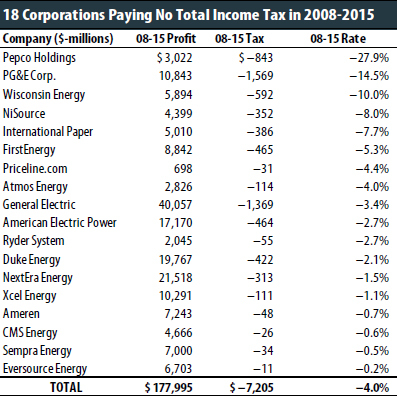 • 18 of these corporations paid less than nothing in aggregate federal income taxes over the 2008-15 period. These companies, whose pretax U.S. profits totaled $178 billion over the eight years, included: Pepco Holdings (–27.9%), PG&E (–14.5%), International Paper (-7.7%), Priceline.com (–4.4%), General Electric (–3.4%), and Ryder System (–2.7%). • 83 of the 258 companies paid less than half the 35 percent statutory corporate tax rate for the eight-year period. And more than two-thirds of the companies, 181 of the 258, paid effective tax rates of less than half the 35 percent statutory corporate income tax rate in at least one of the eight years. Over the 2008 to 2015 period, the 258 companies earned more than $3.8 trillion in pretax profits in the United States. Had all of those profits been reported to the IRS and taxed at the statutory 35 percent corporate tax rate, then the 258 companies would have paid $1.3 billion in income taxes over the eight years. But instead, the companies as a group paid just more than 60 percent of that amount. The enormous amount they did not pay was due to hundreds of billions of dollars in tax subsidies that they enjoyed. • Tax subsidies for the 258 companies over the eight years totaled a staggering $527 billion, including $50 billion in 2008, $65 billion in 2009, $74 billion in 2010, $79 billion in 2011, $65 billion in 2012, $72 billion in 2013, $70 billion in 2014, and $52 billion in 2015. These amounts are the difference between what the companies would have paid if their tax bills equaled 35 percent of their profits and what they actually paid. • More than half of the total tax-subsidy dollars over the eight years — $286 billion — went to just 25 companies, each with more than $5.4 billion in tax subsidies. • AT&T topped the list of corporate tax-subsidy recipients, with more than $38 billion in tax subsidies over the eight years. • Other top tax subsidy recipients included Wells Fargo ($31.4 billion), J.P.Morgan Chase ($22.2 billion), Verizon ($21.1 billion), IBM ($17.8 billion), and Exxon Mobil ($12.9 billion). The effective tax rates in our study varied widely by industry. From 2008 to 2015, effective industry tax rates (for our 258 corporations) ranged from a low of 3.1 percent to a high of 32.7 percent. • Gas and electric utility companies enjoyed the lowest effective federal tax rate over the eight years, paying a tax rate of only 3.1 percent. This industry’s taxes declined steadily over the eight years, from 12.8 percent in 2008 to1.8 percent in 2015. These results were largely driven by the ability of these companies to claim accelerated depreciation tax breaks on their capital investments. None of the 25 utilities in our sample paid more than half the 35 percent statutory tax rate during the 2008 to 2015 period. • Other low-tax industries, paying less than half the statutory 35 percent tax rate over the entire 2008 to 2015 period, included: Industrial Machinery (11.4%), Telecommunications (11.5%), Oil, Gas & Pipelines (11.6%), and Internet Services & Retailing (15.6%). • Only two of the industries surveyed paid an effective tax rate of 30 percent or more over the full eight-year period. Effective tax rates also varied widely within industries. For example, over the eight-year period, average tax rates on oil, gas & pipeline companies ranged from 1.2 percent for Oneok up to 33.3 percent for CVR Energy. Among aerospace and defense companies, eight-year effective tax rates ranged from a low of 5.4 percent for Boeing up to a high of 27 percent for General Dynamics. Pharmaceutical giant Eli Lilly paid only 17 percent, while its competitor Biogen Idec paid 35.3 percent. In fact, as the detailed industry table starting on page 36 of this report illustrates, effective tax rates were widely divergent in almost every industry. The difference in tax rates between companies, even within the same industry, demonstrates how loopholes in our tax code can create huge economic distortions by giving some companies a tax advantage over their competitors. • 55 percent of the total tax subsidies went to just four industries: financial, utilities, telecommunications, and oil, gas & pipelines — even though these companies only enjoyed 35.5 percent of the U.S. profits in our sample. • Other industries receive a disproportionately small share of tax subsidies. Companies engaged in retail and wholesale trade, for example, represented 17 percent of the eight-year U.S. profits in our sample, but enjoyed less than 5 percent of the tax subsidies. It seems rather odd, not to mention highly wasteful, that the industries with the largest subsidies are ones that would seem to need them least. Regulated utilities, for example, make investment decisions in concert with their regulators based on needs of communities they serve. Oil and gas companies are so profitable that even President George W. Bush said they did not need tax breaks. He could have said the same about telecommunications companies. Financial companies get so much federal support that adding huge tax breaks on top of that seems unnecessary. 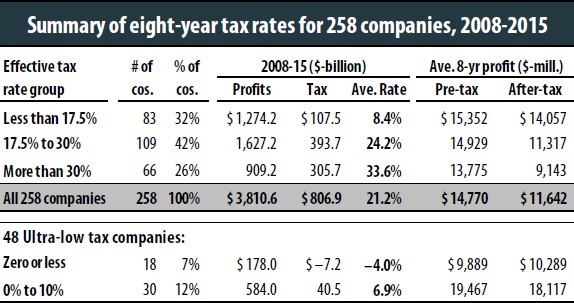 How do our results for 2008 to 2015 compare to corporate tax rates in earlier years? The answer illustrates how corporations have managed to get around some of the corporate tax reforms enacted in 1986, and how tax avoidance has surged with the help of our political leaders. By 1986, President Ronald Reagan fully repudiated his earlier policy of showering tax breaks on corporations. Reagan’s Tax Reform Act of 1986 closed tens of billions of dollars in corporate loopholes, so that by 1988, our survey of large corporations (published in 1989) found that the overall effective corporate tax rate was up to 26.5 percent, compared to only 14.1 percent in 1981-83. That improvement occurred even though the statutory corporate tax rate was cut from 46 percent to 34 percent as part of the 1986 reforms. In the 1990s, however, many corporations began to find ways around the 1986 reforms, abetted by changes in the tax laws as well as by tax-avoidance schemes devised by major accounting firms. As a result, in our 1996 to1998 survey of 250 companies, we found that their average effective corporate tax rate had fallen to only 21.7 percent. Our September 2004 study found that corporate tax cuts adopted in 2002 had driven the effective rate down to only 17.2 percent in 2002 and 2003. The eight-year average rate found in the current study is only slightly higher, at 21.2 percent. As a share of GDP, overall federal corporate tax collections in fiscal 2002 and 2003 fell to only 1.24 percent. At the time, that was their lowest sustained level as a share of the economy since World War II. Corporate taxes as a share of GDP recovered somewhat in the mid-2000s after the 2002-enacted tax breaks expired, averaging 2.3 percent of GDP from fiscal 2004 through fiscal 2008. But over the past five fiscal years (2011 to 2015) that this study examines, total corporate income tax payments fell back to only 1.6 percent of GDP on average. Corporate taxes paid for more than a quarter of federal outlays in the 1950s and a fifth in the 1960s. They began to decline during the Nixon administration and remained low in the Reagan era. By fiscal year 2015, corporate taxes paid for a mere 10.6 percent of the federal government’s expenses. In this context, it seems odd that anyone would insist that corporate tax reform should be “revenue neutral.” If we are going to get our nation’s fiscal house back in order, increasing corporate income tax revenues should play an important role. Corporate lobbyists relentlessly tell Congress that companies need tax subsidies from the government to be successful. They promise more jobs if they get the subsidies, and threaten economic harm if they are denied them. A central claim in the lobbyists’ arsenal is the assertion that their clients need still more tax subsidies to “compete” because U.S. corporate taxes are allegedly much higher than foreign corporate taxes. But the figures that most of these corporations report to their shareholders indicate the exact opposite, that they pay higher corporate income taxes in the other countries where they do business than they pay here in the U.S.
• About 60 percent of these U.S. companies paid higher foreign tax rates on their foreign profits than they paid in U.S. taxes on their U.S. profits. • Overall, the effective foreign tax rate on the 107 companies was roughly equal to their U.S. effective tax rate. 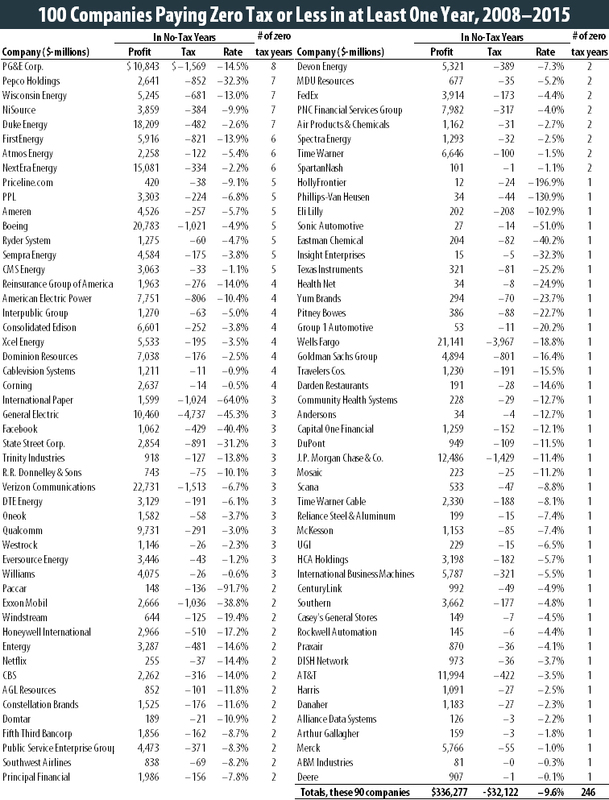 A table showing U.S. and foreign tax rates for each of the 107 companies begins on page 53. How do these figures square with the well-known practice of corporations shifting their profits to countries like the Cayman Islands where they are not taxed at all? 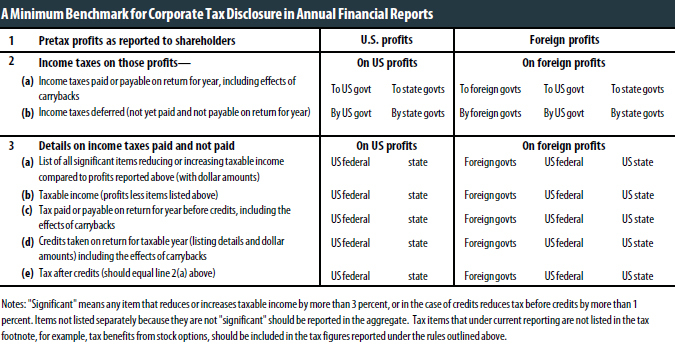 The figures here show what corporations report to their shareholders as U.S. profits and foreign profits, and therefore are likely to reflect profits genuinely earned in the U.S. and those genuinely earned offshore, respectively. But many of these corporations are likely to report something very different to the IRS by using various legal but arcane accounting maneuvers. Some of the profits correctly reported to shareholders as U.S. profits are likely to be reported to the IRS as profits earned in tax-haven countries like Bermuda or the Cayman Islands, where they are not taxed at all. Indeed, this partly explains the low effective U.S. income tax rates that many corporations enjoy. This “profit-shifting” problem will exist so long as our tax laws allow corporations to “defer” paying U.S. taxes on their “offshore” profits, providing an incentive to make U.S. profits appear to be earned in offshore tax havens. The figures make clear that most American corporations are paying higher taxes in other countries where they engage in real business activities than they pay in U.S. taxes on their true U.S. profits. One might note that paying higher foreign taxes to do business in foreign countries rather than in the United States has not stopped American corporations from shifting operations and jobs overseas over the past several decades. But this is just more evidence that corporate income tax levels are usually not a significant determinant of what companies do. Instead, companies have shifted jobs overseas for a variety of non-tax reasons, such as low wages and weaker labor and environmental regulations in some countries, a desire to serve growing foreign markets, and the development of vastly cheaper costs for shipping goods from one country to another than used to be the case. Why do we find such low tax rates on so many companies and industries? The company-by-company notes starting on page 56 detail, where available, reasons why particular corporations paid low taxes. Here is a summary of several of the major tax-lowering items that are revealed in the companies’ annual reports — plus some that aren’t disclosed. Offshore tax sheltering. The high-profile congressional hearings on tax-dodging strategies of Apple and other tech companies over the past couple of years told lawmakers and the general public what some of us have been pointing out for years: multinational corporations and their accounting firms have become increasingly aggressive in seeking ways to shift their U.S. profits, on paper, to offshore tax havens to avoid their U.S. tax obligations. This typically involves various artificial transactions between U.S. corporations and their foreign subsidiaries, in which revenues are shifted to low- or no-tax jurisdictions (where these corporations are not actually doing any real business), while deductions are created in the United States. The cost of this tax-sheltering is difficult to determine precisely, but is thought to be enormous. In November 2010, the congressional Joint Committee on Taxation estimated that international corporate tax reforms proposed by Sen. Ron Wyden (D-Ore.) would increase U.S. corporate taxes by about $70 billion a year. Other analysts have pegged the cost of corporate offshore tax sheltering as even higher than that. Presumably, the effects of these offshore shelters in reducing U.S. taxes on U.S. profits are reflected in bottom-line U.S. corporate taxes reported in this study, even though companies do not directly disclose them. Sadly, most Republicans in Congress, along with some Democrats, seem intent on making the problem of offshore tax sheltering even worse by replacing our current system, under which U.S. taxes on offshore profits are indefinitely “deferred,” with a so-called “territorial” system in which profits that companies can style as “foreign” are permanently exempt from U.S. taxes. This terrible approach, along with its cousin, a “repatriation holiday,” would encourage even more offshore tax avoidance. Accelerated depreciation. The tax laws generally allow companies to write off their capital investments faster than the assets actually wear out. This “accelerated depreciation” is technically a tax deferral, but so long as a company continues to invest, the tax deferral tends to be indefinite. While accelerated depreciation tax breaks have been available for decades, temporary tax provisions have increased their cost in the past eight years. In early 2008, in an attempt at economic stimulus for the flagging economy, Congress and President George W. Bush dramatically expanded depreciation tax breaks by creating a supposedly temporary “50 percent bonus depreciation” provision that allowed companies to immediately write off as much as 75 percent of the cost of their investments in new equipment right away. This provision has been repeatedly extended and is set to phasedown and then expire at the end of 2019. These changes to the depreciation rules, on top of the already far too generous depreciation deductions allowed under pre-existing law, certainly did reduce taxes for many of the companies in this study by tens of billions of dollars. But limited financial reporting makes it hard to calculate exactly how much of the tax breaks we identify are depreciation-related tax breaks. Combined with rules allowing corporations to deduct interest expenses, accelerated depreciation can result in very low, or even negative, tax rates on profits from particular investments. A corporation can borrow money to purchase equipment or a building, deduct the interest expenses on the debt and quickly deduct the cost of the equipment or building thanks to accelerated depreciation. The total deductions can then make the investments more profitable after-tax than before-tax. Stock options. Most big corporations give their executives (and sometimes other employees) options to buy the company’s stock at a favorable price in the future. When those options are exercised, companies can take a tax deduction for the difference between what the employees pay for the stock and what it’s worth. Stock options are also attractive because companies don’t have to reduce the profits they report to their shareholders by the amount that they deducted on their tax returns as the “cost” of the stock options. It does not make sense for companies to treat stock options inconsistently for tax purposes versus shareholder-reporting or “book” purposes. This non-cash “expense” should not be deductible for either tax or book purposes. Because of the complaints about inconsistency, rules in place since 2006 now require companies to lower their “book” profits to take some account of options. But the book write-offs are still usually considerably less than what the companies take as tax deductions. That’s because the oddly-designed rules require the value of the stock options for book purposes to be calculated — or guessed at — when the options are issued, while the tax deductions reflect the actual value when the options are exercised. Because companies low-ball the estimated values for book purposes, they usually end up with bigger tax deductions than they deduct from the profits they report to shareholders. Some members of Congress have taken aim at this remaining inconsistency. In February of 2013, Senator Carl Levin (D-MI) introduced the “Cut Unjustified Loopholes Act,” which includes a provision requiring companies to treat stock options the same for both book and tax purposes, as well as making stock option compensation subject to the $1 million cap on corporate tax deductions for top executives’ pay. Levin calculates that over the past eight years U.S. companies have consistently taken far higher stock-option tax write-offs than they reported as book expenses. 199 corporations in the sample disclosed their “excess stock-option tax benefits” for at least one year in the 2008-15 period, which lowered their taxes by a total of $51.6 billion over eight years. (Some other companies enjoyed stock option benefits, but did not disclose them fully.) The tax benefits ranged from as high as $5.8 billion for Facebook over the eight years to only tiny amounts for a few companies. Just 25 companies enjoyed 57 percent of the total excess tax benefits from stock options disclosed by all of our 258 companies, getting $29.7 billion of the $51.6 billion total. Industry-specific tax breaks. The federal tax code also provides tax subsidies to companies that engage in certain activities. For example: research (very broadly defined); drilling for oil and gas; providing alternatives to oil and gas; making video games; ethanol production; maintaining railroad tracks; building NASCAR race tracks; making movies; and a wide variety of activities that special interests have persuaded Congress need to be subsidized through the tax code. One of these special interest tax breaks is of particular importance to long-time tax avoider General Electric. It is oxymoronically titled the “active financing exception” (the joke is that financing is generally considered to be a quintessentially passive activity). This tax break allows financial companies (GE has a major financial branch) to pay no taxes on foreign (or ostensibly foreign) lending and leasing, apparently while deducting the interest expenses of engaging in such activities from their U.S. taxable income. (This is an exception to the general rule that U.S. corporations can defer their U.S. taxes on offshore profits only if they take the form of active income rather than passive income.) This tax break was repealed in 1986, which helped put GE back on the tax rolls. But the tax break was reinstated, allegedly “temporarily,” in 1997, and has been periodically extended ever since, at a current cost of more than $5 billion a year. We don’t know how much of this particular tax subsidy goes to GE, but in its annual report, GE has singled out the potential expiration of the “active financing” loophole as one of the significant “Risk Factors” the company faces. Notably, the “active financing” loophole is one of dozens of narrowly-targeted temporary tax giveaways that were made permanent at the end of 2015. These tax breaks, known collectively as the “extenders,” have been routinely renewed temporarily for decades. Perhaps the most significant step toward tax fairness that Congress could take would be to reverse course and eliminate those tax extenders that it made permanent and allow the rest of the extenders to expire once and for all. When Congressional tax writers signaled their intention to enact a new tax break for domestic manufacturing income in 2004, lobbyists began a feeding frenzy to define both “domestic” and “manufacturing” as expansively as possible. As a result, current beneficiaries of the tax break include mining and oil, coffee roasting (a special favor to Starbucks, which lobbied heavily for inclusion) and even Hollywood film production. The Walt Disney corporation has disclosed receiving $1.48 billion in tax breaks from this provision over the past eight years, presumably from its film production work. World Wrestling Entertainment has disclosed receiving tax breaks for its “domestic manufacturing” of wrestling-related films. And we were surprised to find that Silicon Valley-based OpenTable, which “manufactures” only online restaurant reservations, has somehow found a way to claim this tax break. President Obama sensibly proposed scaling back the domestic manufacturing deduction to prevent big oil and gas companies from claiming it, but a better approach would be to simply repeal this tax break. At a minimum, Congress and the Trump Administration should take steps to ensure that the companies claiming this misguided giveaway are engaged in something that can at least plausibly be described as manufacturing. Details about companies that used specific tax breaks to lower their tax bills — often substantially — can be found in the company-by-company notes. What about the AMT? The corporate Alternative Minimum Tax (AMT) was revised in 1986 to ensure that profitable corporations pay some substantial amount in income taxes no matter how many tax breaks they enjoy under the regular corporate tax. The corporate AMT (unlike the much-maligned personal AMT) was particularly designed to curb leasing tax shelters that had allowed corporations such as General Electric to avoid most or all of their regular tax liabilities. But laws enacted in 1993 and 1997 at the behest of corporate lobbyists sharply weakened the corporate AMT, and now hardly any companies pay the tax. In fact, many are getting rebates for past AMT payments. In late 2001, U.S. House of Representatives leaders attempted to repeal the corporate AMT entirely and give companies instant refunds for any AMT they had paid since 1986. Public outcry stopped that outrageous plan, but the AMT remains a shell of its former self that will require substantial reform if it is to once again achieve its goal of curbing corporate tax avoidance. The general public. As a share of the economy, corporate tax payments have fallen dramatically over the last quarter century. So one obvious group of losers from growing corporate tax avoidance is the general public, which has to pay more for — and/or get less in — public services, or else face mounting national debt burdens that must be paid for in the future. • Honeywell International and Deere both produce industrial machinery. But over the 2008-15 period, Deere paid 31 percent of its profits in U.S. corporate income taxes, while Honeywell paid a tax rate of only 14.9 percent. • Aerospace giant Boeing paid an eight-year federal tax rate of 5.4 percent, while competitor General Dynamics paid 27.0 percent. • Household products maker Kimberly-Clark paid an eight-year rate of 16.9 percent, while competitor Clorox paid 28.1 percent. • Pharmaceutical firm Eli Lilly paid 17 percent of its eight-year U.S. profits in federal income taxes, while Biogen IDEC paid 35.3 percent. • Time Warner Cable paid 7.8 percent over eight years, while its competitor Comcast paid 23.9 percent. The U.S. economy. Besides being unfair, the fact that the government is offering much larger tax subsidies to some companies and industries than others is also poor economic policy. Such a system artificially boosts the rate of return for tax-favored industries and companies and reduces the relative rate of return for those industries and companies that are less favored. To be sure, companies that push for tax breaks argue that the “incentives” will encourage useful activities. But the idea that the government should tell businesses what kinds of investments to make conflicts with our basic economic philosophy that consumer demand and free markets should be the test of which private investments make sense. To be sure, most of the time, tax breaks don’t have much effect on business behavior. After all, companies don’t lobby to have the government tell them what to do. Why would they? Instead, they ask for subsidies to reward them for doing what they would do anyway. Thus, to a large degree, corporate tax subsidies are simply an economically useless waste of resources. Indeed, corporate executives (as opposed to their lobbyists) often insist that tax subsidies are not the basis for their investment decisions. Other things, they say, usually matter much more, including demand for their products, production costs and so forth. But not all corporate tax subsidies are merely useless waste. Making some kinds of investments more profitable than others through tax breaks will sometimes shift capital away from what’s most economically beneficial and into lower-yield activities. As a result, the flow of capital is diverted in favor of those industries that have been most aggressive in the political marketplace of Washington, D.C., at the expense of long-term economic growth. State governments and state taxpayers. The loopholes that reduce federal corporate income taxes cut state corporate income taxes, too, since state corporate tax systems generally take federal taxable income as their starting point in computing taxable corporate profits. Thus, when the federal government allows corporations to write off their machinery faster than it wears out or to shift U.S. profits overseas or to shelter earnings from oil drilling, most states automatically do so, too. It’s a mathematical truism that low and declining state revenues from corporate income taxes means higher state taxes on other state taxpayers or diminished state and local public services. The integrity of the tax system and public trust therein. Ordinary taxpayers have a right to be suspicious and even outraged about a tax code that seems so tilted toward politically well-connected companies. In a tax system that by necessity must rely heavily on the voluntary compliance of tens of millions of honest taxpayers, maintaining public trust is essential — and that trust is endangered by the specter of widespread corporate tax avoidance. The fact that the law allows America’s biggest companies to shelter almost half of their U.S. profits from tax, while ordinary wage-earners have to report every penny of their earnings, has to undermine public respect for the tax system. Determining tax rates paid by the nation’s biggest and most profitable corporations shouldn’t be hard. Lawmakers, the media and the general public should all have a straightforward way of knowing whether our tax system requires companies like General Electric to pay their fair share. But in fact, it’s an incredibly difficult enterprise. Even veteran analysts struggle to understand the often cryptic disclosures in corporate annual reports. And many amateurs come up with (and unfortunately publish) hugely mistaken results. The fact that it took us so much time and effort to complete this report illustrates how desirable it would be if companies would provide the public with clearer and more detailed information about their federal income taxes. The best way to provide the media, lawmakers and the public the information they need to make informed decisions about our nation’s tax code would be to require companies to publicly disclose key financial data on a country-by-country basis. Ideally, this would include the disclosure of total revenues, profit, income tax paid, tax cash expense, stated capital, accumulated earnings, number of employees on a full-time basis, and book value of tangible assets on a country-by-country basis. For many companies that will already have to file country-by-country reports to the Internal Revenue Service (IRS) in the coming years, providing this information in financial statements would represent little to no additional cost. At a minimum, we need a straightforward statement of what they paid in federal taxes on their U.S. profits, and the reasons why those taxes differed from the statutory 35 percent corporate tax rate. This information would be a major help, not only to analysts but also to policymakers. Repealing the rule allowing U.S. corporations to “defer” their U.S. taxes on their offshore profits so there would be no tax incentive to shift profits to offshore tax havens or jobs to lower-tax countries. Relatedly, companies should be required to immediately pay what they owe on their unrepatriated earnings. Limiting the ability of tech and other companies to use executive stock options to reduce their taxes by generating phantom “costs” these companies never actually incur. Having set “bonus depreciation” on a path toward expiration at the end of 2019, Congress could take the next step and repeal the rest of accelerated depreciation, too. At a minimum, lawmakers should not expand these tax breaks by allowing for the immediate expensing of capital investments. Reinstating a strong corporate Alternative Minimum Tax that really does the job it was originally designed to do. Sadly, these sensible proposals bear little resemblance to the “reform” ideas put forth by some members of Congress. Corporate tax legislation now being promoted by many on Capitol Hill seems fixated on the misguided notion that as a group, corporations are now either paying the perfect amount in federal income taxes or are paying too much. Many members of Congress seem intent on making changes that would make it easier and more lucrative for companies to shift taxable profits, and potentially jobs, overseas. Lawmakers should reject the push to a territorial tax system or the implementation of border adjustment, both of which would likely increase, not decrease, offshore tax avoidance. Real, revenue-raising corporate tax reform is what most Americans want and what our country needs. Our elected officials should stop kowtowing to the loophole lobbyists and stand up for the majority of Americans. This study is an in-depth look at corporate taxes over the past eight years. It is similar to a series of widely-cited and influential studies by Citizens for Tax Justice and the Institute on Taxation and Economic Policy, starting in the 1980s and most recently in 2014. The new report covers 258 large Fortune 500 corporations, and analyzes their U.S. profits and corporate income taxes from 2008 to 2015. Over the eight-year period, these companies reported $3.8 trillion in pretax U.S. profits, and, on average, paid tax on just over half that amount. Our report is based on corporate annual reports to shareholders and the similar 10-K forms that corporations are required to file with the Securities and Exchange Commission. We relied on electronic versions of these reports from the companies’ web sites or from the SEC web site. As we pursued our analysis, we gradually eliminated companies from the study based on two criteria: either (1) a company lost money in any one of the eight years; or (2) a company’s report did not provide sufficient information for us to accurately determine its domestic profits, current federal income taxes, or both. This left us with the 258 companies in our report. Some companies did not report data for all of the eight years between 2008 and 2015, either because their initial public offering occurred after 2008 or because they were spun off of parent companies after 2008. We included these companies in the sample only if they reported data for at least 6 of the 8 years. The total net federal income taxes reported by our 258 companies over the eight years amounted to 40 percent of all net federal corporate income tax collections in that period. Conceptually, our method for computing effective corporate tax rates was straightforward. First, a company’s domestic profit was determined and then current state and local taxes were subtracted to give us net U.S. pretax profits before federal income taxes. (We excluded foreign profits since U.S. income taxes rarely apply to them, because the taxes are indefinitely “deferred” or are offset by credits for taxes paid to foreign governments.) We then determined a company’s federal current income taxes. Current taxes are those that a company is obligated to pay during the year; they do not include taxes “deferred” due to various federal “tax incentives” such as accelerated depreciation. Finally, we divided current U.S. taxes by pretax U.S. profits to determine effective tax rates. A. Issues in measuring profits. The pretax U.S. profits reported in the study are generally as the companies disclosed them. In a few cases, if companies did not separate U.S. pretax profits from foreign, but foreign profits were obviously small, we made our own geographic allocation, based on a geographic breakdown of operating profits minus a prorated share of any expenses not included therein (e.g., overhead or interest), or we estimated foreign profits based on reported foreign taxes or reported foreign revenues as a share of total worldwide profits. Many companies report “noncontrolling interest” income, which is usually included in total reported pre- tax income. This is income of a subsidiary that is not taxable income of the parent company. When substantial noncontrolling income was disclosed, we subtracted it from U.S. and/or foreign pretax income. Where significant, we adjusted reported pretax profits for several items to reduce distortions. In the second half of 2008, the U.S. financial system imploded, taking our economy down with it. By the fourth quarter of 2008, no one knew for sure how the federal government’s financial rescue plan would work. Many banks predicted big future loan losses, and took big book write-offs for these pessimistic estimates. Commodity prices for things like oil and gas and metals plummeted, and many companies that owned such assets booked “impairment charges” for their supposed long-term decline in value. Companies that had acquired “goodwill” and other “intangible assets” from mergers calculated the estimated future returns on these assets, and if these were lower than their “carrying value” on their books, took big book “impairment charges.” All of these book write-offs were non-cash and had no effect on either current income taxes or a company’s cash flow. As it turned out, the financial rescue plan, supplemented by the best parts of the economic stimulus program adopted in early 2009, succeeded in averting the Depression that many economists had worried could have happened. Commodity prices recovered, the stock market boomed, and corporate profits zoomed upward. But in one of the oddities of book accounting, the impairment charges could not be reversed. Some of our adjustments simply reassign booked expenses to the years that the expenses were actually incurred. These “smoothing” adjustments avoid aberrations in one year to the next. a. “Provisions for loan losses” by financial companies: Rather than using estimates of future losses, we generally replaced companies’ projected future loan losses with actual loan charge-offs less recoveries. Over time, these two approaches converge, but using actual loan charge-offs is more accurate and avoids year-to-year distortions. Typically, financial companies provide sufficient information to allow this kind of adjustment to be allocated geographically. b. “Restructuring charges”: Sometimes companies announce a plan for future spending (such as the cost of laying off employees over the next few years) and will book a charge for the total expected cost in the year of the announcement. In cases where these restructuring charges were significant and distorted year-by-year income, we reallocated the costs to the year the money was spent (allocated geographically). a. Impairment charges for goodwill (and intangible assets with indefinite lives) do not affect future book income, since they are not amortizable over time. We added these charges back to reported profits, allocating them geographically based on geographic information that companies supplied, or as a last resort by geographic revenue shares. b. Impairment charges to assets (tangible or intangible) that are depreciable or amortizable on the books will affect future book income somewhat (by reducing future book write-offs, and thus in- creasing future book profits). But big impairment charges still hugely distort current year book profit. So as a general rule, we also added these back to reported profits if the charges were significant. c. Caveat: Impairments of assets held for sale soon were not added back. All significant adjustments to profits made in the study are reported in the company-by-company notes. B. Issues in measuring federal income taxes. The primary source for current federal income taxes was the companies’ income tax notes to their financial statements. From reported current taxes, we subtracted “excess tax benefits” from stock options (if any), which reduced companies’ tax payments but which are not reported as a reduction in current taxes, but are instead reported separately (typically in companies’ cash-flow statements). We divided the tax benefits from stock options between federal and state taxes based on the relative statutory tax rates (using a national average for the states). All of the non-trivial tax benefits from stock options that we found are reported in the company-by-company notes. Ten of the companies in our study report effective eight-year U.S. federal income tax rates that are slightly higher than the 35 percent official corporate tax rate. Indeed, in particular years, some companies report effective U.S. tax rates that are much higher than 35 percent. This phenomenon is usually due to taxes that were deferred in the past but that eventually came due. Such “turnarounds” often involve accelerated depreciation tax breaks, which usually do not turn around so long as companies are continuing to increase or maintain their investments in plant and equipment. But these tax breaks can turn around if new investments fall off (for example, because a bad economy makes continued new investments temporarily unprofitable). Because some companies do business in multiple industries, our industry classifications are far from perfect. We generally, but not always, based them on Fortune’s industry classifications. Some analysts and journalists, along with some corporations, have complained that the “current income taxes” reported by corporations under oath in their annual reports are not a true measure of the income taxes that corporations actually pay. This complaint is mostly incorrect. In fact, “current income taxes,” with a sometimes important downward adjustment that we make for “excess stock option tax benefits,” are a good assessment of companies’ tax situations, and are the only available measure of what corporations pay in income taxes broken down by payments to the federal government, state governments and foreign governments. 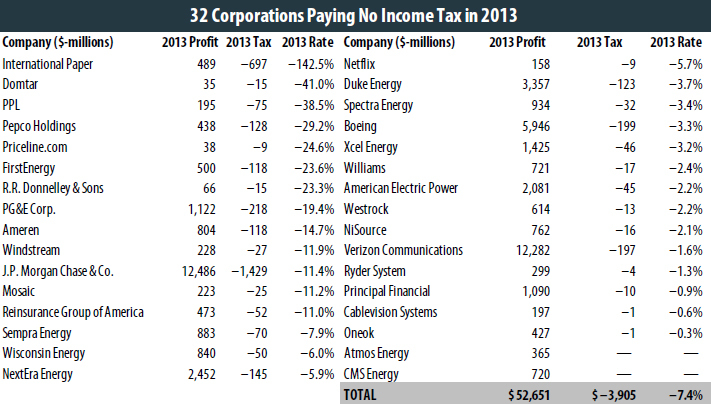 Our report focuses on the federal income tax that companies are currently paying on their U.S. profits. So we look at the current federal tax expense portion of the income tax provision in the financial statements. The “deferred” portion of the tax provision is tax based on the current year income but not due yet because of the differences between calculating income for financial statement purposes and for tax purposes. When those timing differences turn around, if they ever do, the related taxes will be reflected in the current tax expense. The federal current tax expense is just exactly what the company expects its current year tax bill to be when it files its tax return. If the calculation of the income tax provision was done perfectly, the current tax expense (after adjusting for excess stock option tax benefits) would exactly equal the total amount of tax shown on the tax return. But the income tax provision is calculated in February as the company is preparing its 10-K for filing with the Securities and Exchange Commission (SEC), and the company’s tax return isn’t usually filed until September. While the company’s tax return is prepared over those several months, things will be found that weren’t accounted for in the financial statement income tax provision, and numbers that were estimated in February will be refined for the actual return. Those small differences will be included in the following year’s current tax expense, but the impact on our calculations is minimal (especially because we look at the rates over a period of years). If the differences in any one year were material, accounting rules would require the company to restate their prior year financials. A. Excess stock option tax benefits: The first, easily dismissed complaint is that “current income taxes” do not include some of the tax benefits that corporations enjoy when employees exercise stock options. That is certainly true. But our study does subtract those “excess stock option tax benefits” from current income taxes in the tax results we report. B. Dubious tax benefits: A more interesting, but also flawed argument against the use of current income taxes (less stock option tax benefits) involves the accounting treatment of dubious tax benefits that companies claim on their tax returns but are not allowed to report on their books until and if these claimed tax benefits are allowed. Dubious tax benefits, officially known as “uncertain tax positions” and “unrecognized tax benefits,” are tax reductions that corporations claim when they file their tax returns but which they expect the IRS (or other taxing authority) to disallow. on its tax return are unlikely to be approved by the IRS. As a result, the corporation’s current income tax for 2013 that it reports to shareholders (and that we calculate in our reports) will be $1,000 million, the amount that the corporation expects to actually owe in income taxes. 1. More often than not. Suppose that, as the corporation’s tax staff predicted, the IRS in 2015 disallows the $300 million in dubious tax benefits claimed on the company’s 2013 tax return. In this case, the $1,000 million in reported current income tax for 2013 will turn out to have been correct. In 2015, when the dubious tax benefits are disallowed, the company will have to pay back the $300 million (plus interest and penalties) to the IRS. Reasonably enough, the corporation will not report that 2015 payback in its 2015 annual report to shareholders, since it had already reported it as paid back in 2013. 2.Occasionally. Suppose instead that to the surprise of the corporation’s tax staff, the IRS in 2015 allows some or part of the $300 million in dubious tax benefits claimed back in 2013. In this case, the corporation will reduce its 2015 “current income tax” reported to shareholders by the allowed amount of the dubious tax benefits previously claimed on the corporation’s 2013 tax return. First, booking the corporation’s tax windfall in 2015, the year it was allowed by the IRS, makes logical sense. That’s because until the IRS allowed the dubious tax benefits, it was the judgment of the company’s tax experts that the company was probably not legally entitled to those tax benefits. In essence, the IRS’s allowance of all or part of the dubious tax benefits claimed on the company’s 2013 tax return is the same as the corporation receiving an unexpected tax refund in 2015. It’s as if the company had initially borrowed the money from the IRS, but expected to pay it back (with interest). When and if the IRS “forgives” part or all of the “loan,” then the company recognizes the tax benefit. Likewise, suppose you borrow money from you employer with the expectation that you’ll pay it back. But later, your employer forgives your debt. You didn’t have to declare the loan as income when you borrowed the money, but you do have to declare it as income when the loan is forgiven. Second, even if one believed that the 2015 tax windfall ought to be reassigned to 2013, there is simply no way to do so. That’s because corporations do not disclose sufficient information in their annual reports to make such a retroactive reallocation. C. A final point here, regarding a potentially useful measure called “cash income taxes paid”: In their annual reports to shareholders, corporations also report something called “cash income taxes paid.” Cash income taxes paid is net of stock option tax benefits and does not include “deferred” taxes. Unlike current taxes, however, cash income taxes paid subtracts dubious tax benefits that are likely to be reversed later (and adds those dubious tax benefits if and when they are later reversed). “Cash income taxes paid” is sometimes interesting, but it is useless for purposes of measuring the federal income taxes that U.S. multinational corporations pay on their U.S. profits. That’s because “cash income taxes paid” are not broken down by taxing jurisdiction. Instead, this measure lumps together U.S. federal income taxes, U.S. state income taxes, and foreign income taxes. Since most big corporations are multinationals these days, and almost all are subject to both federal and state income taxes, that’s a fatal defect. Even for purely domestic corporations, “cash income taxes paid” is a problematic measure. It often fails to match income in a given year with the taxes paid for that year (since companies don’t settle up with the IRS until after a given year is over). The cash payments made during the year include quarterly estimated tax payments for the current year, balances due on tax returns for prior years, and any refunds or addition- al taxes due as a result of tax return examinations or loss carrybacks. To be sure, if “cash income taxes paid” were reported by taxing jurisdiction and better linked with the pretax income in a given year, then this measure could be useful. But as of now, it is not, except in one way: it supports our use of current taxes as a measure of how much in taxes corporations are really paying. If you compare a company’s total current taxes (after subtracting the excess stock benefits) to cash taxes paid over a period of years, you will see that they are generally very close. The differences, if any, suggest that the effective rate corporations are paying may be even less than what we’ve calculated. Noticeably missing from our sample of 258 profitable companies are some well-known multinational corporations, such as Apple and Microsoft. They are excluded because we do not believe the geographic breakdown of their profits between the U.S. and foreign countries that they report to shareholders. A company reports that all or even more than all of its pretax profits were foreign, even though most of its revenues and assets are in the United States. A company reports U.S. taxes that are a very high share of what it calls its U.S. profits, while its foreign taxes are a very low share of what it calls its foreign profits. A company admits that it has used tax schemes to move profits to low- or no-tax jurisdictions. A company has a large amount of “unrecognized tax benefits” relative to the current income taxes it reports. These “UTBs” are tax reductions that companies have claimed on their tax returns but do not expect to be allowed when their returns are audited (and are thus not allowed to be reported as tax savings to their shareholders). A substantial portion of UTBs involve schemes to shift profits to tax havens. In our previous corporate studies, we generally left out such suspicious companies. In a few cases, with grave reservations, we included some potential “liar companies” that we highly suspected made a lot more in the U.S. and less overseas than they reported to their shareholders. In our current report, we have done better. We have left out of our main analysis 15 companies whose geographic allocations we do not trust (and that we highly suspect have shifted a significant portion of their U.S. profits, on paper, into tax havens). 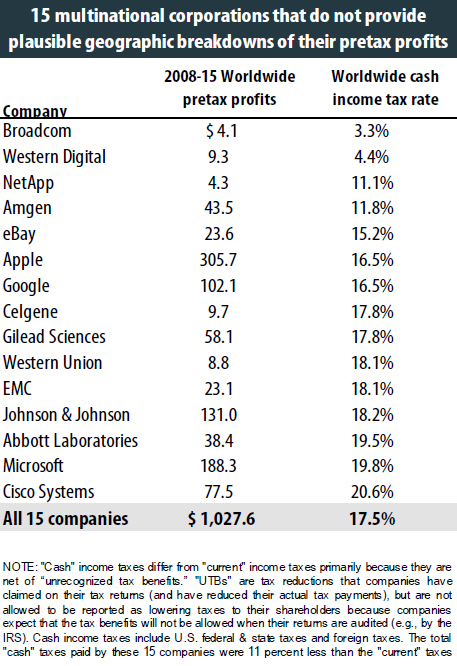 We have included in this appendix some information on these 15 companies. In a table on this page, we show the worldwide pretax profits for these suspicious companies over the 2008-15 period, along with their worldwide income taxes and worldwide effective tax rates. Abbott Laboratories says that only 7 percent of its 2008-15 pretax profits were earned in the United States, despite the fact that it says 40 percent of its revenues were in the U.S. The company also says that its current U.S. federal income tax rate on that tiny share of its profits was 98 percent! In contrast, Abbott says its foreign current tax rate on its purported foreign profits was only 16.2 percent. Amgen says that only 38 percent of its profits were earned in the U.S., despite the fact that it says 78 percent of its revenues were in the U.S. It claims to have paid a 25.3 percent tax rate in the U.S. on its U.S. profits, while paying a mere 5.3 percent tax rate on its foreign profits. Apple claims to have paid a 40 percent U.S. tax rate on its claimed U.S. profits, but only 5.8 percent on its foreign profits. The low “foreign” rate mainly reflects the fact that Apple, for tax purposes, has moved about two-thirds of its worldwide profits to Ireland, where those profits are taxed neither by Ireland nor by the U.S. or any other government. Celgene says that 60 percent of its revenues were in the U.S., but only 12 percent of its profits were U.S. Using Celgene’s breakdown of profit, its U.S. tax rate on U.S. profits would be 39.5 percent, while its foreign tax rate on “foreign” profits would be only 4.1 percent. Cisco says that its U.S. taxes were 57.3 percent of its U.S. profits, while its foreign tax rate was a mere 7.2 percent. eBay claims to have paid a U.S. tax rate of 50.1percent on its U.S. profits, while paying only a 5.1 percent foreign tax rate on its purported foreign profits. (eBay says only a quarter of its worldwide profits were earned in the U.S., even though it says half of its revenues were in the U.S.). EMC claims to have paid a 34.5 percent U.S. tax rate on its claimed U.S. profits, versus a foreign tax rate on foreign profits of only 9.4 percent. Gilead Sciences claims to have paid a 34 percent U.S. tax rate on its U.S. profits, versus a foreign tax rate of only 1.9 percent. Google claims to have paid a U.S. tax rate of 34.3 percent, versus a foreign tax rate of only 5.5 percent. Microsoft says that only a quarter of its profits are in the U.S., even though it says that more than half its revenues are in the U.S. Microsoft would like us to believe that its U.S. tax rate on its U.S. profits was 45.7 percent, while it’s foreign tax rate on foreign profits was only 9.6 percent. NetApp claims to have paid a 53.7 percent tax rate on its U.S. profits, but only 7.0 percent on its purported foreign profits. It says that half of its revenues are in the U.S., but only a sixth of its profits. Western Digital claims to have paid a U.S. tax rate of 50.7 percent, versus a foreign tax rate of only 3.0 percent. Western Union claims a U.S. tax rate of 75.6 percent on its U.S. profits, versus a foreign tax rate of only 6.6 percent. Corporations can receive outright rebates by “carrying back” excess tax breaks to earlier years, and thereby getting a cash refund from the IRS for taxes paid in the past. In addition, companies sometimes obtain favorable settlements of tax disputes with the IRS covering past years. Companies then recognize tax breaks that they did not disclose in their prior financial reports to shareholders because they expected that the IRS would not allow them to keep the money. These settlements can produce what are essentially tax rebates, as the appendix on page 29 explains. In reporting their “current” income taxes paid, companies do not distinguish between the two types of tax breaks. The 1986 Tax Reform Act was expected to increase corporate tax payments by about a third. It may have done even better than that. The statutory rate was increased to 35 percent in President Bill Clinton’s 1993 deficit reduction act. These artificial transactions (often called “transfer pricing” abuses) are particularly available to companies with valuable “intangible property,” such as brand names, secret formulas for soda or drugs, and so forth. By transferring such intangibles to subsidiaries set up in offshore tax havens, companies can then have those foreign subsidiaries “charge” the U.S. parents big fees to use the brand names and so forth, thereby shifting U.S. profits to the havens for tax purposes. Wyden’s international tax reforms are part of a larger tax overhaul bill that he co-sponsored with then-Sen. Judd Gregg (R-NH) and later with Sen. Dan Coats (R-IN). Under “bonus depreciation,” in the first full year that most equipment is placed in service, the depreciation write-offs include: a 20 percent regular write-off for the first half of the year, plus 50 percent bonus depreciation, plus a 6 percent write-off for the second half of the first full year. Employees exercising stock options must report the difference between the value of the stock and what they pay for it as wages on their personal income tax returns. The value of these “excess tax benefits” from stock options is reported in corporate annual reports, and we take it into account in calculating the taxes that companies actually pay. See the Methodology at the end of this study for more details. Over the past decade, companies have been extremely aggressive at avoiding state taxes by shifting profits not only offshore, but also from states that would tax them into states that don’t. In addition, most states also provide their own set of business tax breaks or abatements beyond the federal ones, although these often involve taxes other than corporate income taxes. CTJ’s comprehensive plan for fair, revenue-raising tax reform can be found at www.ctj.org/pdf/taxreformdetails.pdf. The effective federal income tax rates we report in this study should not be confused with an item that companies include in their annual reports with the unfortunately similar name “effective tax rate.” This latter number is a conglomeration of U.S., state and foreign income taxes, including income taxes paid and income taxes not paid (i.e., deferred). It is meaningless for understanding what companies actually pay in U.S. taxes. Companies also explain in their tax footnote why the income tax provision isn’t exactly 35% (the U.S. statutory rate) in their “rate reconciliation.” It might show, for example, that “U.S. Business Credits” reduced their total worldwide effective tax rate by 4.4% or that “Tax on Global Activities” reduced their total worldwide effective tax rate by 19.7%. But this disclosure is a reconciliation of their worldwide effective rate, based on the total of current and deferred taxes, and doesn’t tell you much, if anything, about what they are currently paying in U.S. taxes. Dubious tax benefits are not booked as either a current or a “deferred” tax benefit until and if they lose their dubiousness. In its 2012 annual report, Amgen offers a concise explanation of how dubious tax benefits are treated in financial statements: “We recognize the tax benefit from an uncertain tax position only if it is more likely than not that the tax position will be sustained on examination by the taxing authorities based on the technical merits of the position. . . . The amount of UTBs [unrecognized tax benefits] is adjusted as appropriate for changes in facts and circumstances, such as significant amendments to existing tax law, new regulations or interpretations by the taxing authorities, new information obtained during a tax examination, or resolution of an examination.” Amgen 2015 10-K, p. 54 (pdf p. 56). Companies do provide information on the growth or decline in the amount of dubious tax benefits they have outstanding. This info is not provided on a geographic basis, however. Moreover, it does not distinguish between benefits allowed (which reduces the amount of outstanding dubious tax benefits) and benefits not allowed (which also reduced the amount of outstanding dubious tax benefits). For these two reasons, the currently provided information on dubious tax benefits is useless for our goal of measuring U.S. income taxes paid on U.S. profits. Both current and cash income taxes also include refunds of taxes paid in the past if a company “carries back” “tax losses” to earlier years and gets a refund of previously paid taxes. This can occur even if a company reports book profits. Current and cash income taxes also automatically include payments of taxes “deferred” in the past in the relatively unusual occasions when those “deferred” taxes actually come due and are not offset by additional tax deferrals. (“Deferred taxes” are taxes that are not paid in the current year, but may or may not come due in future years). The good news regarding worldwide “cash income taxes paid” is that, over time, they are usually very similar to worldwide “current income taxes” (less stock option tax benefits). In fact, for the 258 corporations in our study, the overall difference between worldwide cash and current taxes over the 2008-15 period was less than 1 percent. For individual companies, the 8-year current and cash tax figures were also quite similar in most cases. For half of the companies, the eight-year world-wide current and cash effective tax rates were essentially identical (plus or minus 1 percentage point). For 70 percent of the companies, the 8-year worldwide current and cash effective tax rates were within 3 percentage points of each other, and for 84 percent of the companies the 8-year worldwide current and cash effective tax rates were within 5 percentage points of each other. For the handful of outliers, going back a few more years usually brings cash and current taxes back into line with one another. The relatively small exceptions generally seems to involve companies that are very aggressive in claiming dubious tax benefits year after year. Since it takes time for the tax authorities to disallow these dubious tax benefits, worldwide cash taxes paid over time by such companies are typically somewhat lower than “current income taxes” (less stock option benefits).